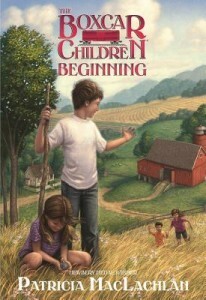 If you have children who are devoted to the Boxcar Children series, and want to have a ‘prequel’, MacLacclan’s children’s book is just right. There is no question this is old-fashioned reading at it’s best. And not everyone loves it. But younger children seem to be enthralled with the Boxcar Children. Since I have enjoyed every children’s book by MacLachlan, it seems fitting that she of all people would take on the job of a prequel. I certainly wonder if a children’s book like this, or in fact, any of the original Boxcar Children, can hold the interest of today’s children. The book forces you to slow down and smell the flowers, hear the cows, feel the snow, and basically be fully present in the natural world. Most children, and I dare say, most of us adults, seem quite far from that world today. So perhaps if nothing else, a children’s book like this is simply a big breathing in of something that once existed and no longer does. I’d use this as a read-aloud to children over 8, because of the inevitable death of the parents in this story. I think children over 8 would like this especially if they are also fans of the series.